For over 20 years, Anacapa Heating & Air has provided expert heating and air conditioning services in Camarillo and surrounding areas. As a family owned HVAC company, we are dedicated to offering our clients the best value for heating and air conditioning repairs, maintenance, sales, and installation/replacement. All of our HVAC services are performed by our team of NATE-certified technicians who are thoroughly trained to accurately diagnose, repair, and maintain all major makes and models of heating and air conditioning systems. We pride ourselves on our personalized and professional customer service, and have served over 20,000 satisfied clients since 1998. We are a Carrier Factory Authorized Dealer and have earned an A+ rating with the Better Business Bureau for our trustworthy business practices and rigorous employee training. Call Anacapa Heating & Air today to experience high quality, affordable heating and air conditioning services in Camarillo and surrounding Ventura County areas. We offer free estimates on new furnace and air conditioner installations and can provide information on available energy rebates and financing offers. We are open 8:00am - 5:00pm, Monday through Friday, and provide on-call service seven days a week. At Anacapa Heating & Air, we are committed to providing top-quality air conditioning services in Camarillo and surrounding areas at an affordable price. We are licensed & insured and fully equipped to provide a complete range of air conditioning services, including installation, replacement, sales, repairs, and maintenance. If you have an air conditioner that is giving you trouble, we can dispatch a technician to come out to your home or business anywhere in or near Camarillo and diagnose the issue. Our techs are familiar with all major AC makes and models and follow the industry's best practices for troubleshooting and repair. If it is time to replace your system, our HVAC experts will work with you to find an energy-efficient, high-performance air conditioning system that matches your needs and budget. As a Carrier Factory Authorized Dealer, we are qualified to offer Carrier's high-quality products and stand behind every installation with a 100% satisfaction guarantee for one full year. 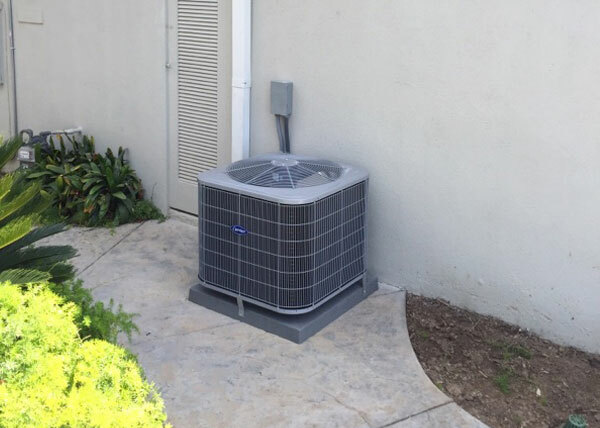 Additionally, we offer comprehensive AC tune-ups and scheduled maintenance services for all of our residential and commercial clients throughout Camarillo. Members of our Preventative Maintenance Club receive priority scheduling, 10% discounts on materials and replacement parts, and a custom maintenance program catered to meet their needs. We value our members and are proud to say that a majority of our business comes from our returning clients and customer referrals. Call us today to learn more about AC services in Camarillo. We are available 7 days a week to schedule appointments. Anacapa Heating & Air has been diagnosing and repairing furnaces for Camarillo homeowners and businesses since 1998. Our experienced HVAC technicians are certified by North American Technician Excellence (NATE) and receive ongoing training to ensure they are up-to-speed with the latest industry standards and best practices. As a result, our team can be trusted to accurately perform a thorough inspection of your heating system. Our initial diagnostics fee is $79, and we use fair, flat-book pricing for all furnace repairs. Because our technicians work efficiently and we keep our service vehicles fully-stocked with common heating replacement parts, we can often complete most repairs within the same visit. We offer Camarillo residents an affordable 20-point heater/furnace tune-up to keep their heating system running its best. This multi-point service helps lower stress on the system, lower energy usage, improve indoor air quality, and extend the life of the equipment. It also helps us catch small problems before they turn into major ones. Because we believe in the value of our furnace tune-ups, we recommend that our Camarillo customers also consider our Preventative Maintenance Club. This Club includes two service visits a year for homeowners, or three or four visits a year for businesses. Not only do you not have to worry about scheduling your AC tune-up in the spring and furnace tune-up in the fall, but you'll also receive priority scheduling for service and 10% off parts and materials for repairs. Give us a call today to learn more. Whether you wish to add heating to your room addition or replace an old furnace with a new, energy-efficient model, call Anacapa Heating & Air. We're the local experts in home heating. As a testament to the quality of our service, we have over 20,000 satisfied customers and an A+ rating with the BBB. Additionally, we are one of the few heating and air conditioning companies serving Camarillo that is a Carrier Factory Authorized Dealer. This designation was not given; it had to be earned by demonstrating to Carrier that we have honest business practices, exceptional customer service, and thoroughly trained and NATE-certified technicians. As a result, we are qualified to sell and install Carrier's impressive line of furnaces. Every furnace we install is backed by a one-year “100% satisfaction or your money back” guarantee as well as a 10-year manufacturer warranty. Call today to schedule a free, no-obligation in-home estimate if you are interested in replacing your furnace or installing a completely new heating system. Anacapa specializes in mini-split air conditioners and heat pumps. 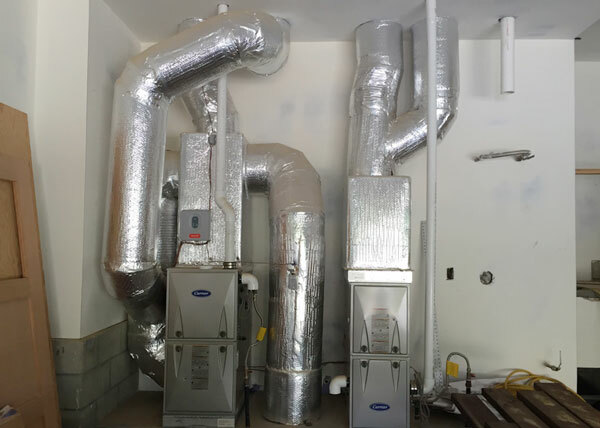 Mini-splits are a superior choice for Camarillo clients who want an effective way to heat and cool their home or business without a centralized ducting system. Our Mitsubishi and Carrier mini-splits are versatile and can be designed to provide optimal and controllable indoor climates for offices, room additions, garages, computer rooms, and more. By taking the time to conduct a thorough on-site consultation, we're able to determine the most best solution for each customer's specific heating & cooling needs. Call today to schedule a consultation. Our team of HVAC technicians are highly qualified to diagnose and repair all major makes and models of mini-split systems. We have years of experience diagnosing problems, filling refrigerant, replacing parts, fixing leaks, and performing other common mini-split system repairs. We provide a two-hour service window for all of our service calls, and we will call ahead if there will be any kind of delay. 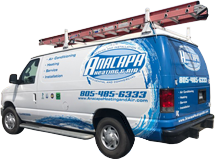 Anacapa's service vehicles are branded and fully-equipped with commonly used HVAC replacement parts, making it easier for us to complete most repairs in just one visit. We also offer comprehensive, multi-point inspections and tune-ups to keep mini-split systems running reliably and efficiently. Call to schedule your mini-split repair or maintenance service in or near Camarillo today. With over 20 years of industry experience, Anacapa Heating & Air is Camarillo's go-to HVAC company for high-quality ductwork cleaning services. Duct cleaning is one of the most important maintenance procedures needed to keep your heating and air conditioning system running efficiently. Clean air ducts help to maintain optimal indoor temperatures and prevent harmful pollutants such as mold, bacteria, dust, smoke, and pet dander from circulating throughout your Camarillo home or commercial property. Our technicians use BrushBeast by Rotobrush to safely and effectively clean ductwork. This powerful duct cleaning equipment works to loosen debris, remove heavy build up, and improve the air quality circulating through your home or business. Call us today to schedule air duct cleaning services anywhere in or near Camarillo. I am so glad I found this company to replace my 25 year old furnace. They were absolute professional in everyway. From phone discussions, to giving me an estimate and then onto installation (which I was concerned about) and then follow through and follow up, these professionals were on top of their game. Check them out if you are in the market for heating and air conditioning products.